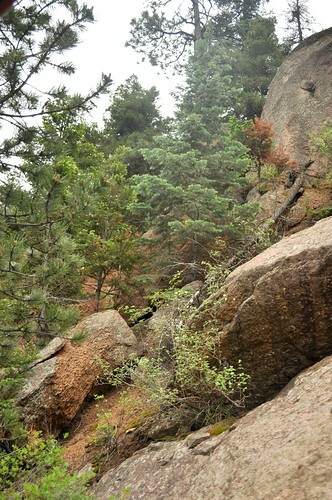 My mom came for a visit last week and we did pretty much every touristy thing that you can do in Colorado Springs, including a couple of things that I hadn't done before. 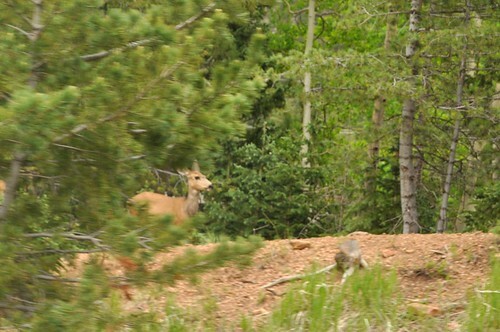 One of these things was to ride up Pike's Peak on the Cog Train. My parents claim I did this once before, but I was obviously way too young to remember. They tell me stories like this all the time, leading me to believe that they did all kinds of cool road-trippy things when I was too young to retain the memories, but somehow the basic idea of road trip as amazing vacation still got through (obviously). We picked the perfect day to go because there was a big storm a couple of days later, and Pike's Peak was blanketed in snow again. It was cool but not too cold and it only snowed for a little while at the summit. Here are some views from the train. 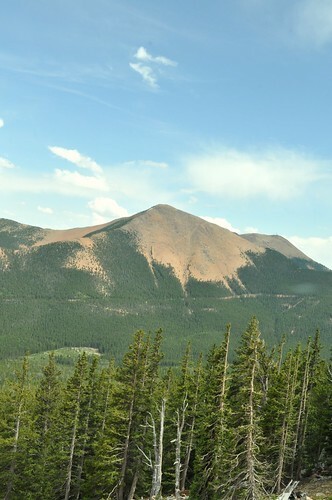 Pikes Peak is not actually the tallest mountain in Colorado, if that's what you were thinking. 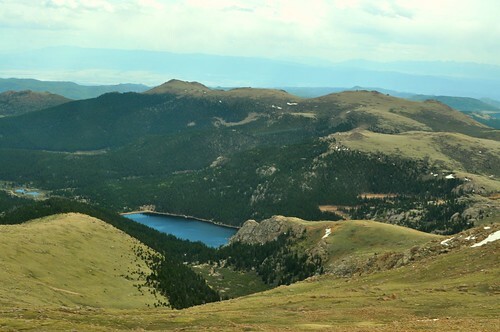 It is, however, one of 53 "fourteeners" in the state which is how, in Colorado, we refer to mountains over 14,000 feet in elevation. 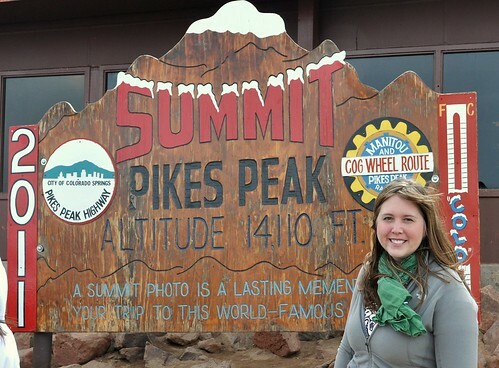 The summit of Pikes Peak is at 14,110 feet. A Cog Train uses a large gear (or "cog wheel") with teeth that runs on a track in between two regular rails. 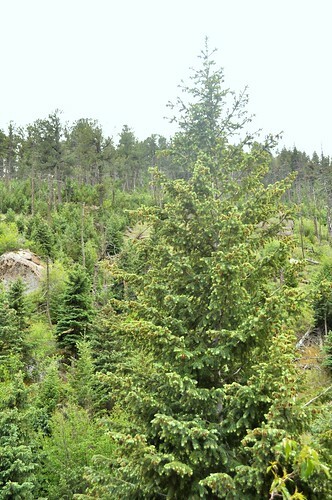 This allows the train to climb a steeper grade than your average train. A regular adhesion train can travel on a 4-6% grade, your car about 5-7%, and the cog train, 25%! This means, at the steepest part of the track, the front of the train is 1 story above the back. Since we were facing downhill for both the uphill and downhill parts of the journey, it was an ab workout to stay in your seat. 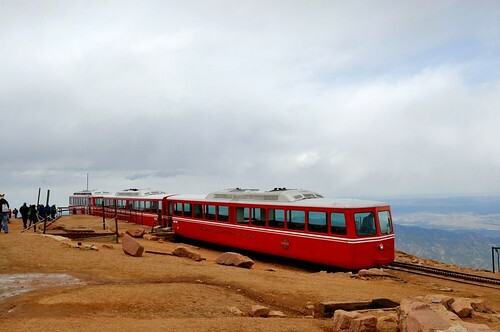 The Pikes Peak Cog Railway was built in 1891. It runs year-round, and has a special snowplow to clear the tracks. If the snow becomes too compacted, it achieves the consistency of cement and has to be dynamited from the tracks. (Are you loving my fun facts? All courtesy of our conductor). It takes about 3 hours to make the round-trip on the train, including the 20 min summit stop. 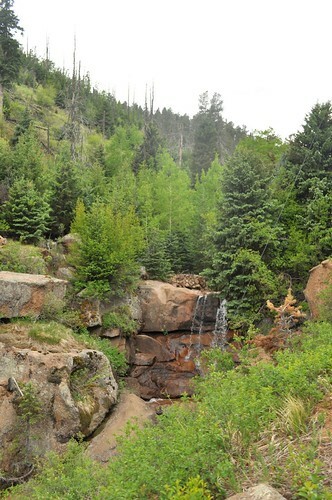 At the top, they serve award-winning high-altitude doughnuts covered in fudge, which have apparently been featured on The Food Network. We did not indulge, however, since I had made doughnuts just that morning! 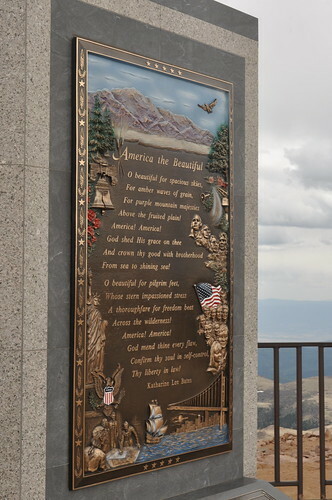 After a trip to the Pikes Peak summit, Katharine Lee Bates, inspired by the purple mountain majesties above the fruited plain, penned "America the Beautiful," which is inscribed on a plaque at the summit. 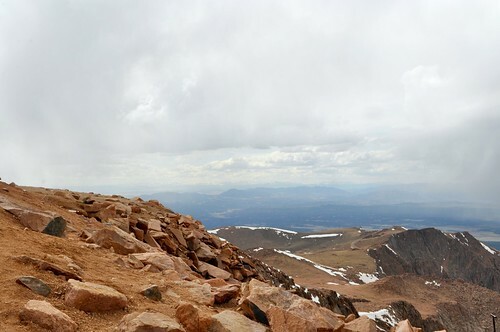 On a clear day, you can see into five states from the top of Pikes Peak. They are Colorado, Kansas, Oklahoma, Wyoming, and New Mexico. 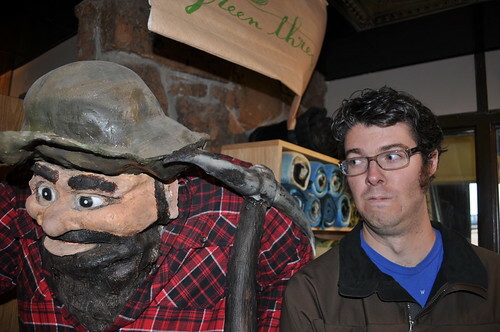 There was also this really weird guy in the gift shop that Mike posed with. Who else embraces the "tourist in your own town" mentality? Or are you a "we live here, so we never go" type? Man, trains are awesome. That must've been a fun ride. Stay away from the creepy prospector, Mike! That's so neat! I don't think I've ever heard of a cog train before. It's really fun and scenic. 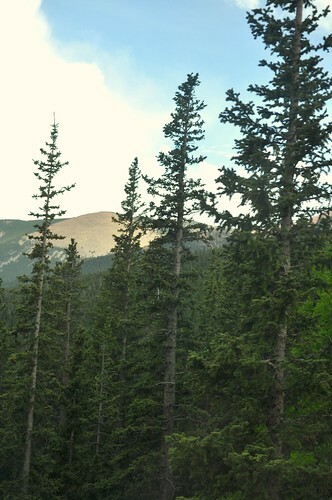 If you're even in Colorado, I recommend it.